Be kind and and compassionate to one another, forgiving each other, just as in Christ God forgave you. God. Work. School. Family. Ministry. Leisure. Social media. In the midst of a busy schedule, It is almost second nature to miss out on the blessing of appreciation. 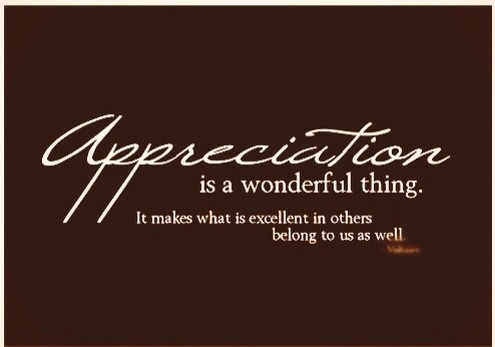 Did you know that appreciation is not just a blessing to the receiver, but also to the one giving it? Appreciation is gratitude in action and thankful recognition. We often miss out on the truth that PEOPLE MATTER, a whole lot! It is vital that we take out time each day to show appreciation to the people in our lives that truly have excellent qualities reflected in wonderful actions. As Ephesians 4:32 says, Being kind and compassionate includes appreciating others and not overlooking the blessing of who they are. It will make what is excellent in others belong to us as well because we will learn to embrace them with the love that they deserve. In order for something to be a blessing, there needs to be people who are being blessed. Automatically, when we appreciate what others do and who they are, we become a part of the making of a blessing. We help identify and honor those who truly are God given to us! While we're at it, we remind ourselves that we need one another and it keeps us humble. Praise God for appreciation! Copyright © 2018 CCI OneMission. All Rights Reserved.